When students are enrolled in art classes or pursing a career in art, making an art portfolio should be on the top of their priority list. Student art portfolios are one way of saving completed projects and efficiently displaying them to professors and other members of the art community. Most often a student art portfolio consists of original artwork. The artwork can be contained and organized into a large folder to make it easier for transport and viewing. This may be challenging when some of the original artwork is very large and does not fit into standard folders and binders. Fortunately, there are specially designed folders created with art students and professionals in mind. One efficient way to store and display artwork is with an art portfolio case. These cases come in a variety of sizes and styles to accommodate many types of artwork and projects. Art portfolio cases resemble a briefcase or tote bag and close securely to protect the artwork and any other contents inside. The exteriors of portfolio cases are available in different colors and materials. For instance, if students will be outdoors regularly and will need to show their work, the best option is a waterproof and hard covered portfolio cases that can shield the artwork from the elements. There are soft fabric and mesh exteriors as well. 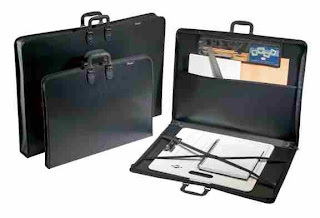 Most portfolio cases also have a handle or strap and are lightweight making them easy to carry. The interiors of portfolio cases are extremely versatile. There are pockets, compartments, and storage areas for classroom and office supplies. The dimensions of portfolio cases are listed for both the interior and exterior to ensure that the desired artwork or project will fit properly. One of the most obvious reasons to create a student art portfolio is to preserve artwork. Many students will soon discover that art portfolios are also an important part of art exhibit applications and interviews for jobs. Displaying artwork in an organized and professional way will demonstrate your desire for success and attention to detail.